Ceramic tiles from Vietri sul mare decorating the walls of the village. Despite countless attempts at imitation by others, ceramics from Vietri (le ceramiche di Vietri) have proven themselves to be so unique that they can’t be duplicated. Thanks to the ceramics’ rich history and tradition, not to mention the specialized system used to produce it, Vietri’s ceramics really are in a class of their own. The process and the result are both deeply rooted in the tradition of authentic Italian handicrafts. Le ceramiche di Vietri boast a centuries-old tradition that dates back to the 15th century. Its history has been documented through ancient furnishings and fittings, as well as old documents on the art of ceramics that were found in the area. While ceramics in Vietri were originally created in little workshops, the way they are produced has been refined through the years. The high quality of Vietri ceramics, and the improved production methods, allowed the product and the town to become famous the world over (even though the clay used was imported from nearby Salerno). The starting point of its widespread fame was the 18th century when Vietri sul Mare rose to popularity, mainly through its export to Naples. When trade was developed between Vietri, Sicily and Tuscany the foundation was laid for the beginnings of the modern ceramic industry in the region. At present Vietri’s ceramics are characterized by an old tradition that co-exists with a modern approach to production, which still safeguards the typical decorative patterns recalling an ancient style.The colors used are those inspired by the Mediterranean sea landscape, in particular the deep blue of the sea and the light blue of the sky. Shepherds and peasants, rural life, farmyard animals and seascapes are icons of a ceramic tradition linked to a dreamy vision of peasantry, which we still find on objects created by skilled craftsmen today. Over time Vietri also hosted famous artists like Richard Dolker and Irene Kowaliska who managed to launch Vietri’s ceramic all over the world. 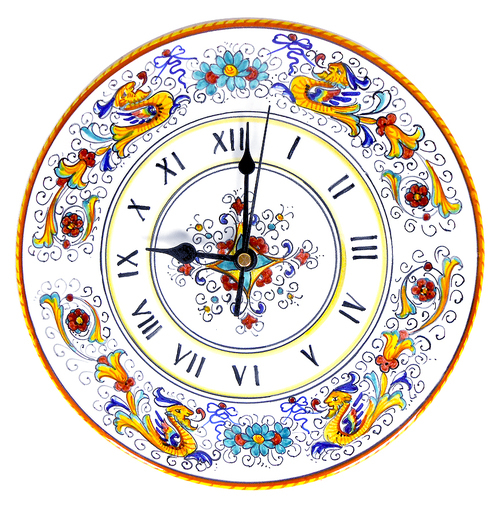 Vietri’s ceramics are not just functional but often used as ornamentation in the home. The ceramics’ vivid colors and dreamy scenes bring a brightness to any home and the beautiful objects della casa (of the home) like trays, dishes and tureens also come in handy when serving food. The most important thing, if you want to experience the real quality and beauty of Vietri ceramics, is to ensure you’re buying the real product–make sure not to fall for any imitators and save your pennies for the real deal!